Enjoy the comforting softness of this Contemporary style chair in your living room or den. Sleek lines and dark exposed wood feet give this piece an elegant, modern look. Featuring DuraCoil cushions and supportive sinuous spring design, this piece is as durable as it is comfortable. The Maddie Contemporary Style Chair with Flared Arms by Broyhill Furniture at AHFA in the area. Product availability may vary. Contact us for the most current availability on this product. Padding & Ergonomics Seat cushions are constructions from soy-based foam, requiring less, plus pillows and backs cushions are made from recycled plastics. 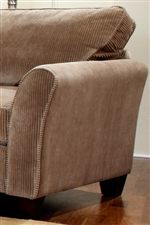 Cushion cores are engineered to provide optimum comfort and durability. For comfortable, eco-friendly seat cushions that last, Broyhill uses DuraCoil™ technology. Like a pillowtop mattress, it's a system of individually wrapped coils sandwiched between two thick layers of soy-based foam. DuraCoil™ cushions outperform most foam cushions in standardized industry tests. Back cushions with multiple compartments to keep fiber in place. The Maddie collection is a great option if you are looking for Contemporary furniture in the area.